Wings of Protohermes davidi. From Comstock (fig. 150) . 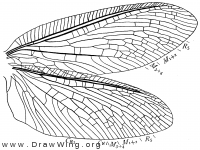 Wings of dobsonfly Corydalus primitivus. From Comstock (fig. 149) . Fore wing of dobsonfly Corydalus cornutus. From Comstock (fig. 148) .